A high stakes political drama erupted in Cebu last week after President Benigno Aquino III ordered the suspension of Governor Gwendolyn Garcia for six months over administrative charges filed against her by the late Vice Governor Gregorio Sanchez Jr. back in 2010. Sanchez died of lung cancer last year, but his case versus Garcia lived on. The investigation was supposedly spearheaded by now-deceased Department of Interior and Local Government chief Jesse Robredo. His successor Mar Roxas is saying that he is merely abiding by Robredo’s recommendations in the suspension of Garcia before the Office of the President (OP). Click here to read the OP’s 11-page decision regarding Garcia’s case. Curiously, under the leadership of Garcia, Cebu received a seal of good housekeeping from DILG – a citation signed by Robredo himself. Garcia, who is Cebu’s first female governor, is now on her third and final term as governor. Her tenure ends on June 30. Hence, the six-month suspension effectively cuts her term short. Garcia decries this as a “power grab,” an allegation Roxas denies. According to the news last Friday, the governor sought a temporary restraining order (TRO) against her suspension before the Court of Appeals (CA). The petition has been given to the CA’s 12th division led by Associate Justice Vicente Veloso but no TRO has been issued yet. The courts will be on a holiday until January 6, a reality which limits Garcia’s ability to seek immediate legal remedies. “Over my dead body,” the governor said when asked if she plans to leave the provincial capitol. In fact, the Garcia clan celebrated the traditional Christmas dinner inside her office. For his part, Police Chief Superintendent Regional Director Marcelo Garbo Jr says that physically evicting Garcia from the capitol remains a possibility as long as there’s an order from the national government. The standoff in Cebu has obvious implications at the national political scene. For one, the Garcias are no stranger to the national spotlight. The governor is a close ally of Gloria Macapagal-Arroyo during her presidency, and comparisons have frequently been made between the two. During the 2004 presidential elections, Arroyo won in Cebu by over a million votes, enough to provide her with a winning margin over challenger Fernando Poe, Jr.
Then-President Gloria Arroyo administered Garcia’s oath of office in 2010. Pablo Garcia, the clan patriarch, unsuccessfully sought the House Speakership in 2007. The elder Garcia is one of the deputy speakers in the current 15th Congress, where he gained attention recently for his fierce opposition to the soon-to-be enacted Reproductive Health bill. In 2008, the Government Service Insurance System under the tutelage of Winston Garcia, the governor’s younger brother, launched a takeover bid of the then-Lopez family controlled Manila Electric Company. The corporate power struggle resulted in a protracted legal battle after individuals from the CA and the Presidential Commission on Good Government got dragged into the controversy. Garcia and her party One Cebu has entered into an alliance with Vice President Jejomar Binay’s United Nationalist Alliance for the 2013 midterm elections. Initially considered a potential senatorial candidate, Garcia eventually dropped her bid after surveys showed that she has little chance of winning. She is instead running to succeed her brother Pablo John in Congress. He in turn will run for governor against Hilario Davide III, the son and namesake of the retired Chief Justice. Davide ran for the position in 2010 but lost by close to 100,000 votes. When Malacanang announced Roxas’ appointment as the next DILG chief, critics immediately framed the move in the context of the coming 2013 polls and the 2016 presidential elections. As the head of that department, Roxas will have direct supervision of all local government units and police forces nationwide (the statement of Cebu’s police chief a few paragraphs ago underscores this). 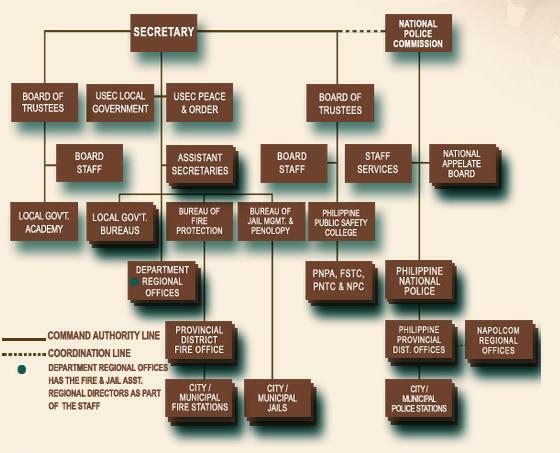 Check this link to see the DILG’s organizational structure. Despite his loss to Binay two years ago, Roxas is still considered a likely presidential candidate come 2016. He is also the president of the ruling Liberal Party. To avoid allegations that he might take advantage of his new cabinet post to further his political prospects, some quarters urged him to resign from his role in LP. He did not, but he went on leave to silence his critics. This is when things get more interesting. The DILG has installed Agnes Almendras-Magpale, a member of the Cebu provincial board who became vice governor after Sanchez’ death, as acting governor for the next six months. Magpale happens to be the elder sister of Jose Rene Almendras, Aquino’s energy secretary. Almendras is identified with the Roxas-allied Balay faction in the cabinet. Aquino and Almendras had known each other since their college days at the Ateneo de Manila University. What are the stakes, really? Tip O’Neil, late United States House Speaker, famously said that “all politics is local.” This proved to be Binay’s lethal weapon against Roxas in 2010. Vera Files reported that in his six terms as mayor, Makati City “forged sisterhood ties with more than 200 municipalities and cities all over the country.” Based on the official results of the 2010 vice presidential elections, Binay defeated Roxas in much of Luzon, Mindanao, and Metro Manila. Roxas swept all Visayas provinces except Biliran, Leyte, and Samar. Binay won the race by over 700,000 votes. Should Roxas and Binay fight again in 2016, their roles will already be reversed. Binay remains the country’s most popular politician with an approval rating of 82%, according to a December 2012 Pulse Asia survey. Roxas will be the underdog in a rematch against Binay, and if he is to win the presidency, he must solidify his base of support in the Visayas region and pickup support elsewhere in the country. With its population of over four million (according to the 2010 national census), Cebu is bound to be a major battleground province again come 2016. Having an ally installed as the province’s acting governor during the course of the 2013 elections is definitely good news for LP. FOLLOWING BINAY’S PLAYBOOK? Binay together with former President Joseph Estrada and Senate President Juan Ponce Enrile went to the Cebu provincial capitol last December 23 to show their support for Garcia. In October 2006, the DILG under then-Secretary Ronaldo Puno issued a suspension order against Binay over allegations of graft and corruption. Like Garcia now, Binay stayed in the Makati City Hall and defied the order. He was able to get a TRO from the CA after three days. Again, the suspension order against Binay was served in mid-October and not a few days before Christmas. PS: Governor Garcia has been mentioned as a potential running-mate for at least three potential candidates – Noli de Castro (who ultimately did not run at all), Richard Gordon, and Gilbert Teodoro in the lead-up to the 2010 presidential elections.